Since 1999, Regency Custom Homes has built some of the most stunning custom homes in Phoenix and surrounding areas including Scottsdale, Paradise Valley, Fountain Hills and Arcadia. Steve Wiggins, founder and president of Regency Custom Homes, started developing floor plans at age seven, and realized his boyhood dream of building stately homes and estates by mastering the art of quality craftsmanship. His passion for customized homebuilding is evident in every residence built by Regency Homes, including the unique designs, exceptional finish work and true quality. We just finished a large project with Steve and we couldn’t be happier. We had issues with the original contractor we hired and Steve stepped in and completed the job on time and within budget which is unheard of in the construction business. Steve was on the job every day and the communication was excellent. We would not hesitate to use Steve and Regency on our next project. Regency Customer Homes exceeded our expectations building our Arizona vacation home. Steve was always a step ahead of us making suggestions and we always felt like he was building his own home. His level of concern, creativeness and quality is simply amazing. Since we reside in Minnesota, Steve would provide regular photographs, videos and even installed cameras for us to access when we were curious what was going on. He managed the budget like it was his own money and during our closing with our banker, they said “We wish all of our client’s builders were as organized, detailed oriented and flexible to work with”. We truly will continue to recommend Steve (Regency Custom Homes) and highly suggest anyone thinking of building a home to simply have a conversation with him and you will see what we are talking about. He is not your ordinary builder, he is way much more than that. Thank you Steve for giving us more than we expected! Steve and his organization are true professionals. He personally was involved in all aspects of building our home. From design to engineering to build his attention to detail was exceptional. He enhanced our ideas and gave us a home we enjoy everyday. Steve builds a quality home and he is a quality person. We had a great experience with Regency Homes. Our remodel was done while we were mostly out of town and Steve was a great communicator with updates and pictures. The project was finished sooner than expected and everything looked fantastic! I would highly recommend Regency Custom Homes for a remodel or new housing project. Building a home can be quite daunting and the horror stories from friends can be discouraging. Our experience was quite the opposite. Steve Wiggins was a joy to work with. He never got rattled! And when we came up with a new idea or a change his answer was always the same: " We can do that"! He has a wonderful demeanor, always has a smile and is extremely professional. His subs are top-notch just like him. His work product speaks for itself. Our home is magnificent! Our home is absolutely beautiful and so well built. There are times that it still takes my breath away. Seeing the web page was one of those times. The pictures are marvelous. It is so much fun to have our friends and family not in Phoenix be able to see the home…Thank you for all you have done on our behalf. Kory and I want to thank you for all that you’ve done for us in regards to our new home. Moving from Washington, you have made this transition an easy one. As we have told you before, we decided to move to Arizona because we fell in love with this home the moment we walked in the front door. After living here a month we feel the same way. Although it was a spec house, we know it was built just for us. We continue to discover new things we love about the house and the surroundings every day. I must admit that you have proven me wrong. I could never have imagined how smoothly building a home from over 1,500 miles away could be. Heidi and I are very grateful to you and your excellent team for making our experience so pleasant. 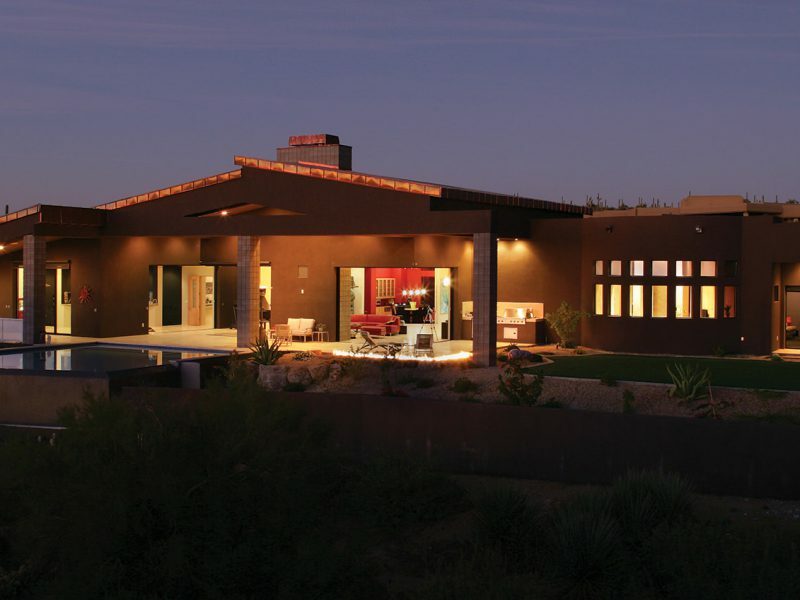 We dreamed of building a home more contemporary than most you will find in the Southwest. You not only made our dream a reality, but also did it without the typical pain expected during the design and construction process. We are thrilled with the outcome, and strongly believe the value you added to the process far exceed our cost.